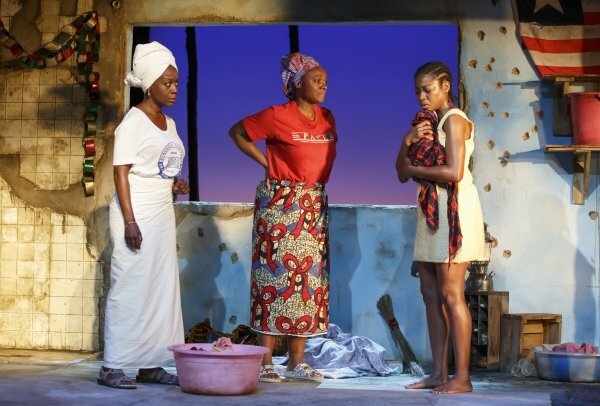 Eclipsed, the new play by Danai Gurira, is a post-colonial scholar’s dream. Set in war-torn Liberia in the early 2000s, Eclipsed follows a group of wives held captive by a warlord in the midst of terror and oppression. The women, who for most of the story are referred to only by their numbered rank as wives (No. 1, No. 3, No. 4 — No. 2 has run off to join the fighting), are forced to create an unlikely bond for sheer survival. The loss of their names becomes a sort of metaphor for their powerlessness in this particularly brutal and horrific period in African history. Each was kidnapped from her family and taken as property by this band of rebels. The eldest, 25-year-old Helena (played by the magnificent Saycon Sengbloh) becomes a mother figure to the younger wives, the youngest of whom is 15 and freshly ripped away from her family. The fifteen-year-old, known only as “the girl,” becomes her own metaphor for the oppressed woman scrambling for any bit of power she can get in this moral vacuum. Played brilliantly by Oscar-winner Lupita Nyong’g, the girl is different from her companions. She’s from a wealthy family. She’s schooled in politics, and seems to have greater understanding of the post-colonial nature of Liberia’s struggles. And she’s literate, reading to the women from a tattered book about President Bill Clinton, which becomes entertainment and a distraction for the wives. But in a tragic turn, an attempt to tear herself away from the tyranny of her oppressor, the girl joins in the fighting at the prompting of wife No. 2, luring her away with promises of wealth and protection. Eclipsed does not shy away from making its audience uncomfortable. And rightfully so—this is a story about a war being waged by children, brutality, and sheer lack of humanity. At one point, we are forced to listen to the girl describe how she was witness, and entirely complicit, as a group of soldiers raped and killed a child. This is not breezy theater. This is a story that will challenge you and ultimately make you question the ways in which you are complicit in small daily horrors. For those, like myself, interested in the ways that colonialism has left a lasting legacy on native cultures (born and raised in Hawaii, I’m very much familiar with this discourse), you’ll on many occasions get a glimpse at the U.S. role in all this. As one of the wives comments on President Bill Clinton: he’s their big boss, too. Afterall, the U.S. made Liberia. Eclipsed runs through the end of November at The Public Theater.